Our Contact Lens department, under the direction of our optometrist, Dr. Heidi Schulman, fits all types of contact lenses, clear and colored, including conventional soft lenses, disposables, and toric lenses for astigmatism. Multifocal contact lenses are also available so that in many cases, the need for reading glasses may also be reduced or eliminated. When indicated, we also fit the latest gas-permeable hard contact lenses both for cosmetic wear and for treatment of certain eye diseases. Prior to you being fit, we will perform a thorough eye examination to ensure that there are no eye diseases that might be a problem with contacts and that we can expect the kind of clear comfortable fit that you expect. Our fitting techniques are individualized to your own personal needs, and you will be assured that we will follow up on the initial fitting to make certain that there are no problems that could lead to later difficulties. If you are interested in wearing contact lenses and have never worn them before, please call for an appointment for a complete eye examination first. If your eyes are healthy and you are a good candidate, we will then set up an appointment for an initial fitting session. Please understand that we cannot write down the prescription for your contact lenses until we actually go through the fitting process first. Once we have determined that the lens is sitting properly on your eye, providing you with clear vision, and not causing any medical problems, then, and only then, can we write the prescription on paper. Prior to that, we really do not know what the prescription is (until the lens is actually fit to the eye). If you are currently wearing contact lenses, we can evaluate the fit of them during the course of the regular eye exam. However, unless you can provide us with the actual specifications of your contacts (the brand, the lens model number, lens power and lens base curve), we cannot replace them. Once you give us this information, then new or replacement lenses or prescriptions can be provided. If you are a new patient to our practice please try to have your contact lens information available at the time of your examination with us. If a lens is uncomfortable, do not leave it in your eye. If cleaning, re-wetting, reinserting, or other usual maneuvers don't help, see your eye doctor. If your eye (or both eyes) remains uncomfortable, irritable, painful, or red even after removing the lens, have your eye examined. It may be scratched or infected. While the use of "multipurpose" solutions is both popular and convenient, some lens wearers develop allergies or toxic reactions to them. This problem is much more common when you switch from one brand to another. We strongly advise that if you are using a particular brand that works well and does not create any problems, to stay with that same brand, even if a competitive brand is available at a lower price. If your tolerance of contacts becomes progressively less, you may be developing an allergic reaction. Remove your contacts, and have your eyes examined. Never sleep in your lenses, even if they are "approved" for extended wear. Always remove them and disinfect them each day (unless you have daily disposable lenses which should be thrown out). Keep a copy of your contact lens prescription including the manufacturer, model, size, power and base curve. If you need a replacement and have this information, a new lens can obtained very quickly. Without this information, refitting might be needed. 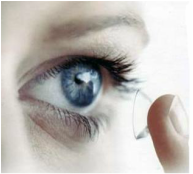 Finally, if you are fully dependent on contact lens correction, have an up-to-date pair of glasses as a backup. Wear them regularly (such as in the evening after removing the contacts) so that you can still function with them if you are in a situation where you cannot wear contacts or don't have any.